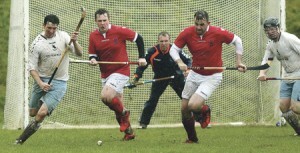 The fine details of shinty’s league structure for 2015 have still to be confirmed — with just six weeks to go before the start of the playing season. At the end of last year clubs voted overwhelmingly to re-establish a ten team premier league — extending the division by two teams. However, that decision has had the knock on effect of creating uncertainty as to exactly who will play in the divisions below the top flight. A void in the national first division has been created after Bute — who finished bottom of the league last year — opted to take a step back and regroup in the south area leagues. So far the Camanachd Association have yet to confirm who will take the islanders place — with several of the potential contenders understood to be reluctant to make the step up. From the south Oban Celtic, Aberdour, Strachur, Taynuilt and Kilmory are being sounded out by the governing body, while in the north Strathglass and Inverness are the two eligible candidates. Should Inverness accept the place they would find themselves in the surely unique situation of being promoted, despite finishing bottom of the league the previous year. In 2014 the city side ended the season at the foot of the north first division, having won just one of their 14 games. Camanachd Association opera­tions manager Astie Cameron said no decision would be made until the association board meet on the 28th January. He confirmed that there are further issues to resolve after Glengarry indicated that they wished to drop down from the north first, and instead take part in the north second division this year. Ullapool side Lochbroom, meanwhile, have opted to drop out of the leagues altogether.